The issue N7 of The EUMM Monitor available now! 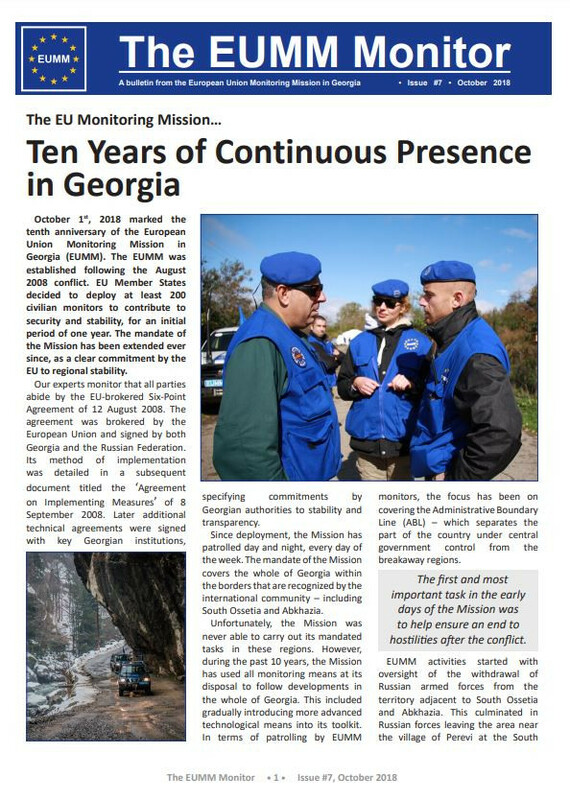 October 1st, 2018 marked the tenth anniversary of the European Union Monitoring Mission in Georgia (EUMM). The EUMM was established following the August 2008 conflict. EU Member States decided to deploy at least 200 civilian monitors to contribute to security and stability, for an initial period of one year. The mandate of the Mission has been extended ever since, as a clear commitment by the EU to regional stability. Our experts monitor that all parties abide by the EU-brokered Six-Point Agreement of 12 August 2008. The agreement was brokered by the European Union and signed by both Georgia and the Russian Federation. Its method of implementation was detailed in a subsequent document titled the ‘Agreement on Implementing Measures’ of 8 September 2008. Click here to access the new 7-th issue of the EUMM Monitor.